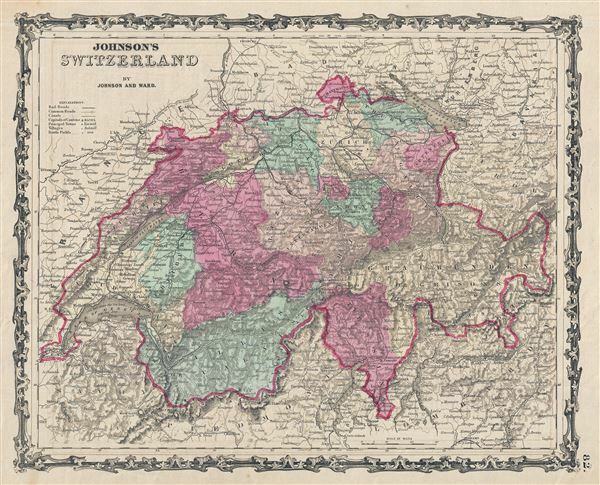 This is Johnson and Ward's 1863 map of Switzerland. It covers Switzerland divided into its constituent cantons. Various towns, cities, rivers, railways and several other topographical details are noted with relief shown by hachure. The map is color coded according to canton. Features the fretwork style border common to Johnson's atlas work from 1863 to 1869. Published by Johnson and Ward as plate no. 82 in the scarce 1863 edition of Johnson's Family Atlas. Very good. Text on verso. Minor toning. Rumsey 0352.057 (1864 edition). Philips (atlases) 843.